Well, enough for formalities, as the NYC group Hello Nurse have got both the call and response ready for any inter gender social situation. Sounding like a cross between Weezer, The Police, and Fugazi, this quartet's expansive insight to the indie rock genre elicits a lot of finger snapping, hand clapping, and feel good sing alongs, especially on the contagious "Animalympics". Melding jagged indie rock with cuddly '50s make-out music, Hello Nurse make the kind of music that would be included in the big budgeted film version of Happy Days, complete with leather jackets and pink scarves aplenty. 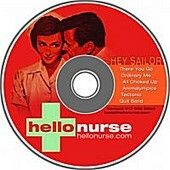 For a lighthearted yet ultimately satisfying listening experience, get a musical checkup from Hello Nurse.